“Leap Year” tells the story of a successful working woman played by Amy Adams. Her job is to take upper class apartments and furnish them before the realtor starts shopping them. She is very good at her job and once the apartment is sold, she returns and removes all the furnishings. Her opinion is she is selling people a dream. She is also a dominating woman who believes that her strong will is enough to get her anything she wants. When her boyfriend fails to propose to her on the night she believes it is coming, she becomes depressed. Her absentee father (John Lithgow) pops back into her life after a lengthy absence and recounts how her grandmother proposed to her grandfather on Feb. 29 in a Leap Year, an old Irish tradition. She sets off to Dublin, where her boyfriend is on a business trip, with the intentions of proposing to him on Leap Year. Anna (Adams) is a stereotypically overly organized woman, the type who wipes down the edge of the counter when sipping wine at a bar. Her boyfriend, Jeremy (Adam Scott), is an overworked cardiologist. They live by BlackBerry scheduling. Just one problem (and, of course, there wouldn’t be a movie if there weren’t a problem): Bad weather diverts her plane from Dublin to Wales, forcing her to rent a fishing boat, which drops her at a remote village on the opposite side of Ireland from Dublin. There, she and Declan O’Callahan (Matthew Goode) meet cute when she walks into his pub and hires him to drive her to Dublin. 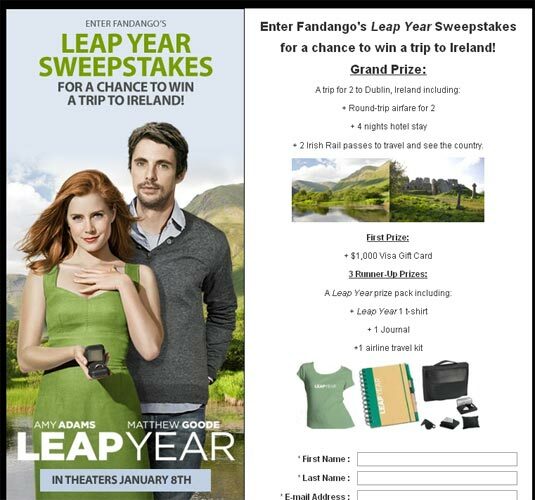 Leap Year Sweepstakes for a chance to win a trip to Ireland! 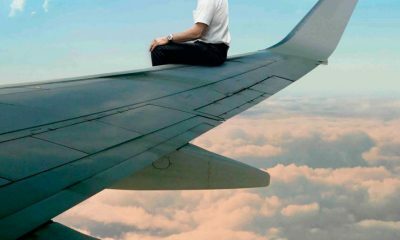 Fandango is giving away a trip for 2 to Dublin plus a $1000 Visa Cash Card. Visit the sweepstakes site and enter to win! Don’t miss the tons of other great prizes they have to offer too! I like its, this movie itas very interesting to me.